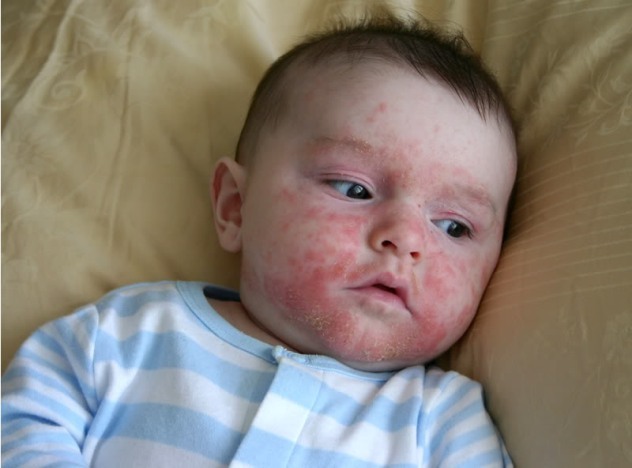 Learn what is infantigo (also called impetigo) Rash, its symptoms with images, causes, and treatment in children and adults. Infantigo (misspelled as infintigo or infentigo) is a medical term for a common bacterial skin infection that can affect anyone, regardless of age, race, or gender. It can occur in adults but is seen far more often in children. Children between the ages of 2 to 6 years of age are the most common prey of it. Impetigo is another term used to describe this condition. 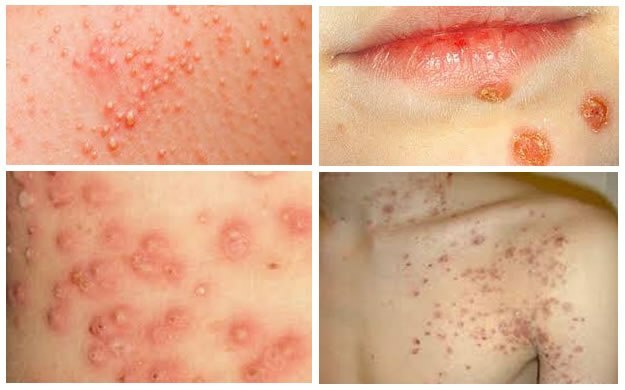 Impetigo in children or adults is contagious and can be spread to others through different means including close contact or by sharing towels, sheets, clothing, toys, or other items. Scratching can also spread the impetigo sores to other parts of the body. Infantigo patient on antibiotics or some other form of treatment can go back to school or work after being on the treatment for 24 hours. Bacteria that cause this condition is basically of two types i.e. non-bullous impetigo and bullous impetigo. Non-bullous impetigo means “crusted infantigo” and is the most common type, while bullous impetigo means “large blister”. They are also referred as strep and staph germs, and they can live on your skin without harming you. As an adult, you can get infantigo by having a cut or break in the skin that allows either of these germs to get into your skin cells. However, a child can also get infantigo in a similar manner but is usually through not only a cut but through an insect bite or scrape. A child can have it due to diaper rash. If you have healthy skin, even then you can get infantigo, most possible source is through direct contact with an already infected person or bacteria itself. There is even a possibility that you can get it if an infected person sneezes on your or around you. Read to know about Infantigo and all relevant information about it including causes, symptoms, and treatment. There are two kinds of bacteria, which are responsible for causing Infantigo i.e. strep (streptococcus) or staph (staphylococcus). These bacteria usually enter the body when the skin has already been irritated or injured. Skin can have problems such as eczema, poison ivy, insect bites, burns, or cuts, and here is the chance for bacteria to enter into your skin. Besides these conditions, you can also develop impetigo in completely healthy skin. You have small red spots ,and then you noticed that these spots changed to blisters that eventually break open. You may not feel painful, but they may be itchy. Then you will notice that the pimple-lesions that are usually surrounded by red skin will fill with pus and then begin to break down, in couple of days. They look crusty along with ooze fluid. Despite the fact that they are very itchy but don’t scratch, because it will spread the infection. The lesions usually appear on your neck, hands, diaper area, and face but it can appear on any part of your body. They can be smaller like pimple size to being larger than a coin. If you have these conditions then it’s strongly recommended to visit your doctor. By examining skin simply, he will be able to diagnose it. Sometimes a small piece of a sore is removed and send to a lab to identify the bacteria. Though it’s rare, but your blood or urine samples may also be taken. Check out the following infantigo images to look for infantigo symptoms. 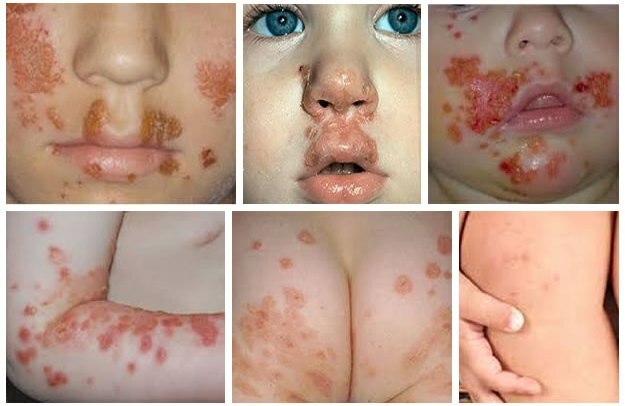 These infantigo/impetigo images, pictures and illustrations are given here for references purpose to match with this bacterial skin infection disease. Antibiotics are used for Impetigo treatment. Incase of mild impetigo, an antibiotic ointment or cream is enough. You have to put the prescribed ointment on the sores as per doctor’s directions. For cases of more serious impetigo, a doctor may also prescribe antibiotic pills. By applying the ointment or taking the pills exactly as prescribed, most of the sores will be completely healed in 1 week. Once you have started taking the antibiotic you the healing should start in a couple of days. Make sure that you take all the antibiotics as prescribed till it finishes. Once healing is in process, you can gently start to wash the areas that are infected with antiseptic soap and clean gauze. Be sure to keep fingernails short and clean to help keep them from scratching. Keep the infected area covered with a loose plastic bandage or gauze and tape. If you touch any infected area ,wash your hands in hot soapy water before touching anything else.